Watch me make this Southern Peach Cobbler From Start To Finish! This southern peach pie is very similar to THIS old-fashioned peach pie that I posted during the start of this blog! That one continues to be a fan favorite but it was time I refreshed the recipe a bit and gave you guys another way to prepare the filling without using canned peaches. This peach cobbler filling is much easier! You just dump everything in a bowl. No simmering or making a syrupy sauce. This recipe uses frozen peaches that you cover with sugary mixture and let thaw out. As the peaches thaw it creates a nice syrupy glaze. It does take a few hours for the mixture to thaw at room temperature. Of course you can cheat and pop it into the microwave for a few seconds. I usually start the filling hours before I start preparing dinner so by the time dinner is done I’m shoving this cobbler in the oven! Is this a peach cobbler or peach pie? Many people would call this a peach pie since it has a double pie crust but you’ll find that in some parts down south we refer to this as a peach cobbler! You scoop it out with a spoon. It’s a messy, buttery, sinful mess!! Whenever I make a peach pie it’s one that will usually hold it’s shape when cut and filled to the brim with peaches and a tapioca or flour for thickening. I’m making a fresh peach pie this summer so stay tuned for that if that’s what you’re hunting for! 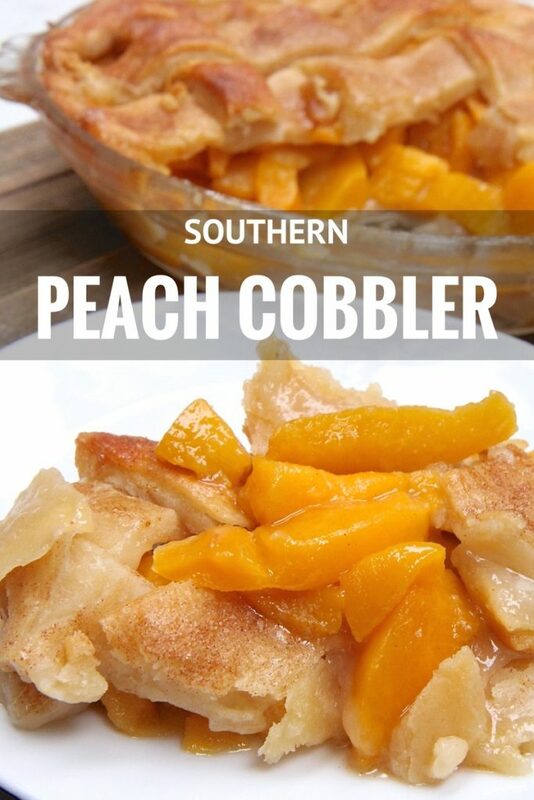 What makes a good peach cobbler? THE PEACH COBBLER CRUST- Homemade crust is the only way to go here people! This crust y’all!! Yes it’s the pie crust I use with all of my recipes just about and I fall more and more in love with it each time I make it!! For me, a good peach cobbler must have the bomb crust! This pie crust is crisp on the outside yet soft on the inside and it tastes like a buttery biscuit!! I think that’s why I love it so much, it has flavor!!! And that generous sprinkling of cinnamon sugar on the crust just makes it simply divine! I could seriously eat it all by itself. THE PEACHES- I’ve made peach cobbler with canned peaches, frozen peaches, and fresh peaches and they all taste amazing! Normally I’d prefer fresh over anything but I really can’t tell a huge difference over using canned, frozen or fresh in cobbler recipes. For this recipe I used frozen and decided to skip the cinnamon and spices that I put in my other peach cobbler recipe. I wanted the flavor of the pure peaches to shine through and they sure did!! All that peachy aroma just took over my kitchen!! THE PEACH COBBLER SYRUP- You know what’s one of my favorite things about a peach cobbler? It’s when that peachy syrup combines with the underside of the crust and makes it all gooey! OMG soooo good!!!! There is nothing worst than a watery, soggy peach cobbler. It’s really important that you let the peaches thaw out completely! You don’t want them releases that extra water inside of your cobbler. Also be sure to use a slotted spoon when adding the peach filling to the pie. You preaches will release enough juices of their own so we don’t need the extra syrupy mixture. Now, go make yourself a homemade southern peach cobbler and eat it with reckless abandon! You deserve it! Divide pie crust in two equal balls. Roll out the first ball and place it into a greased deep dish pie plate. Roll out the second ball and cut into 8 strips, long enough to reach both sides of pie plate. Refrigerate crusts until ready to use. In a large bowl add peaches and sugar. Toss so that peaches are coated in sugar. Stir in vanilla and lemon juice. Remove pie crusts from the fridge and sprinkle half the cinnamon sugar mixture onto the bottom crust, pressing into the crust. Add on the lattice top crust being sure to seal the edges. Brush with egg whites and sprinkle with remaining cinnamon sugar. When done, remove from oven and remove foil. Let cobbler cool. Spoon cobbler into a bowl. The juices from this pie has bubbled over in the oven on me twice. Be sure to put a baking sheet under the pie to prevent this. It's no fun cleaning this sticky stuff out of the oven. 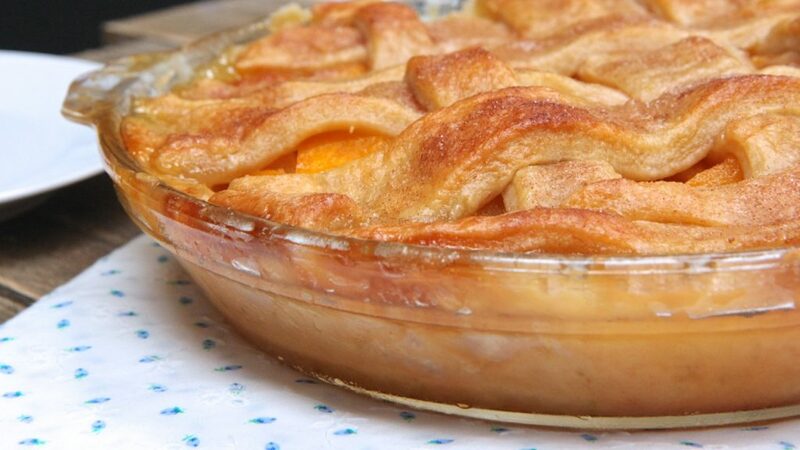 I’ve made this pie crust my Go To pie crust, its Awesome, and so is the peach cobbler recipe. Thank you!!! I chose your recipe out of all others because the picture of your cobbler look delicious, inviting and like my Mother’s. Once I start reading and printing your recipe, I find that there are way too many steps and that there’s definitely short cuts that can be done to make preparations and process easier and quicker. I know there are some others out there who don’t like to use a recipe with too many steps, it disencourages is but thank you for sharing it. Thank you thank you! I have made this recipe exactly as you listed and it was perfect!! My husband and I tried it for Thanksgiving and it was so good we made it again for Christmas! Many thanks for sharing this, it made our holidays! We’re still talking about how delicious it was. This is now my go to recipe…oh and the crust, it was soooo amazing…pure buttery flaky goodness. Didn’t show that how to make the crust. I’ve linked a video to that recipe. I made this cobbler Saturday, by Sunday evening the entire thing was gone! I gave half to my parents. My mother (who does not eat peach cobbler) tasted the crust and immediately asked me what I put in it. Had me scared for a minute because I am not a big time cook and thought she didn’t like it. Before I left my parents house she told me I was making peach cobbler next week, for Thanksgiving. Yea, its that good. Listen to Monique and make the pie crust from scratch using her recipe. One thing I have to adjust is the temperatures. My oven gets overly hot and the crust burnt a bit, so I will lower it from 400 to maybe 375. Thank you for this recipe!!!! !